Schulz, U. & K. Eisermann (2017) Morphometric differentiation between subspecies of Resplendent Quetzal (Pharomachrus mocinno mocinno and P. m. costaricensis) based on male uppertail-coverts. Bulletin of the British Ornithologists' Club 137: 287-291. 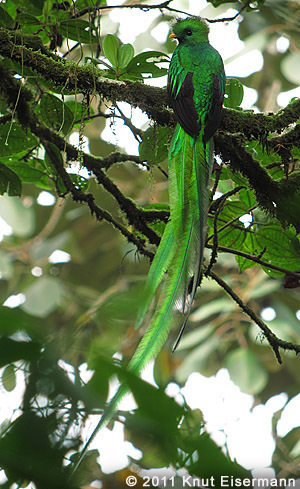 Abstract: Resplendent Quetzal Pharomachrus mocinno is endemic to montane cloud forests of Middle America. Disjunct populations in the highlands north (southern Mexico and northern Central America) and south of the lowlands of Nicaragua (Costa Rica and Panama) have been recognised subspecifically by several authorities (e.g. Ridgway 1911, Cory 1919, Dickinson & Remsen 2013, Gill & Donsker 2017), but have also been suggested to merit species status (Solórzano & Oyama 2010). We present morphometric differences in the elongated uppertail-coverts of adult males. We analysed width and length of the uppertail-coverts of 73 adult male specimens in European ornithological collections. Mean width and mean length of the uppertail-coverts were significantly greater in northern P. m. mocinno compared to southern P. m. costaricensis. Our data support a previously published proposal to treat the two taxa as species based on molecular and other morphological data. Datos preliminarios fueron publicados en: Schulz, U. & K. Eisermann (2012) Morphologische Unterscheidung von Guatemala-Quetzal Pharomachrus mocinno und Costa-Rica-Quetzal P. costaricensis anhand der Schmuckfedern. Ornithologischer Anzeiger 51: 70-74. Eisermann, K. (2013) Noteworthy nesting record and unusual bill coloration of Resplendent Quetzal Pharomachrus mocinno. Cotinga 35: 76-80. El Quetzal es un especialista de bosques nubosos y restringido al sur de México y Centro América.